Photography became an interest of mine while serving in the Air Force in the late 1960’s. I worked in a photo interpretation office in the Pacific during the Vietnam War and had the opportunity to spend a lot of time in a darkroom, some of it printing my own photographs. I turned that early experience into a job with a well-known Atlanta studio. They did everything photographic from portraits and weddings to crime scenes and autopsies. I learned to work in every kind of situation. In 1973, my friend Marianne Carlisle had moved to Newnan and married Billy Thomasson whose family owned the Newnan Times-Herald. They needed a photographer – she called – and 44 years later I am still in Newnan. I have served as President of the Newnan Rotary Club and been active in the community, often donating my skills to worthwhile projects. 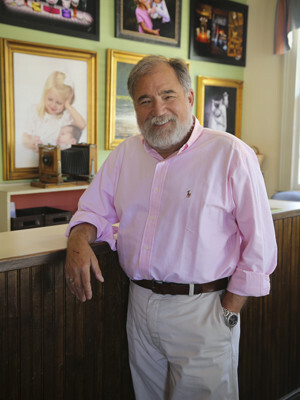 As I honed my photographic skills through practice and advanced courses in many photographic fields, the opportunity arose to purchase Newnan’s oldest studio in 1980. The studio was begun by Samuel F. Jackson on the north court square in the 1880’s, it passed to Mr. Tarpley, who photographed Newnan families for decades and then sold it to his son-in-law, Mr. Webb. He decided within a couple of years to sell it to Joe Norman. Joe operated the studio from 1954 to 1980. We have always offered the full range of photographic services – studio and location portraits, senior portraits, commercial work including products and facilities (large and medium format), business portraits, copy and restoration work, and weddings and events. When the days of all my Hasselblad equipment slowly came to an end and I embraced the digital format, my capabilites increased as did my renewed enthusiasm for photography. We have constantly upgraded our equipment as new technology became available. We still attend workshops and seminars to keep up with the ever changing world of digital imaging. I am a Life Member of the Professional Photographers of America.